Incredibly simple dessert with a great wow factor. Increase the quantity of Turkish delight though. I didn't serve with the suggested cream, which I think would be too cloying and sweet. Suggest yoghurt instead. Needs the full hour, take the lid off towards the end to allow excess water to evaporate. The honey flavor was not distinct enough for my taste and I do not know what the butter adds to the recipe except for calories. I much prefer Nigel Slater's "Rhubarb with orange", which has very similar ingredients and tastes absolutely delicious. 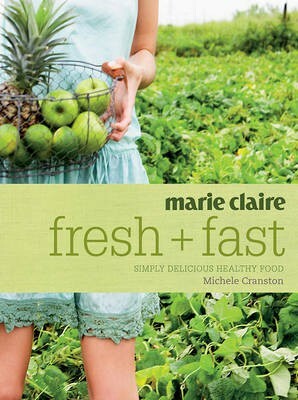 The new Marie Claire cookbook offers the quality and style synonymous with the brand, presented in an exciting new format. It contains more than 100 outstanding new recipes from Michele Cranston, each with the focus on fresh ingredients, that can be put together quickly and easily to produce delicious, nutritious meals, snacks, desserts and drinks for good health and vitality.